VEGAS Movie Studio 14 is a low cost video editing package that provides the essential functionality of MAGIX’s more expensive VEGAS Pro software. The entry-level product costs $49.99 while the more powerful Movie Studio Platinum (which I am reviewing here), costs just $79.99. In common with the more expensive VEGAS Pro video editing package, Movie Studio lets you create videos by importing clips onto a multi-track timeline where you can edit them by cutting, copying, pasting and trimming them. You can merge one clip into another by adding a range of fades and transitions. And you can also apply a large range of video effects to alter colour and brightness, glows, lens flares, pixilation effects and so on. The transitions and effects are arranged in a panel at the top-left, a previewer is shown to its right and the timeline is docked underneath. As with VEGAS Pro, multiple effects can be added to a single clip and when you do this they are arranged as a linked list or ‘plugin chain’ which can be shown in a popup dialog. Here you can delete unneeded plugins or select a specific effect from the chain in order to edit its parameters. Other essential features of Movie Studio include the ability to pan and crop videos to zoom in and out or move the viewing area up or across a video clip; you can record and edit audio tracks and apply effects such as reverb and distortion or apply an audio restoration filter to remove unwanted clicks or background noises; and when you are finished you can create your final video either by selecting the ‘Make a movie’ option (the simplest way) or by producing the video in a large number of rendering formats such as Quicktime, Video For Windows and MPEG-2, each of which provides a large range of options to tailor the output. 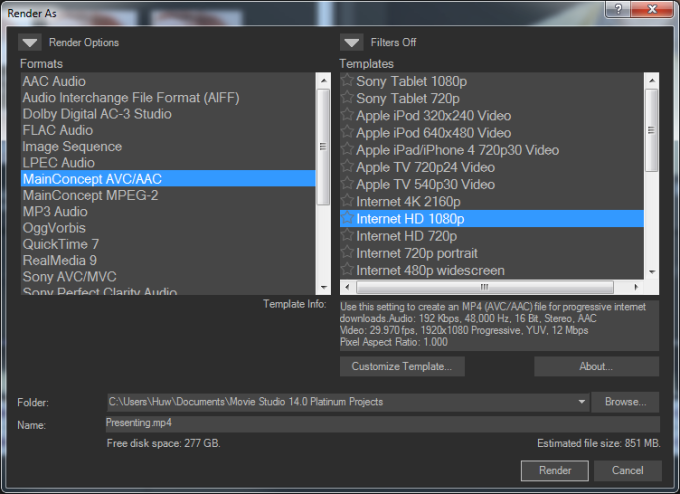 There are a few new features in this latest release such as ‘hover scrub’ editing – that is the ability to select and trim clips simply by moving the mouse over a popup video preview; there is a multi-camera editor to help you edit together clips taken simultaneously with more than one camera; and various new video effects and transitions have also been added. 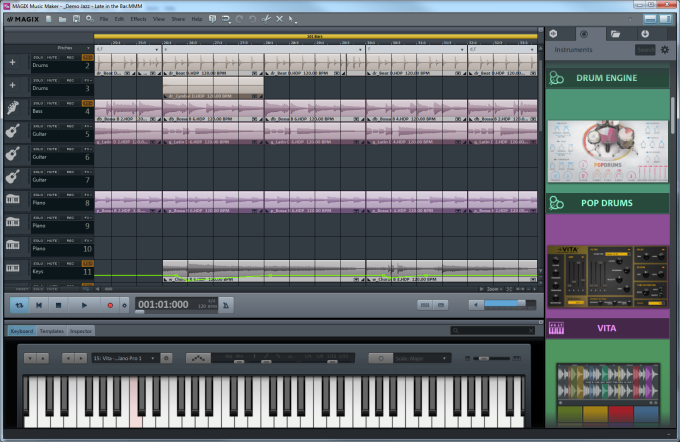 As an extra bonus, all editions of Movie Studio now come with a separate music editing application called Music Maker. This lets you record and edit music either by ‘playing’ an on-screen keyboard or mixing together pre-recorded sounds (‘loops’) on a multi-track timeline, editing them in much the same way you would edit video clips in Movie Studio. As the stand-alone edition of Music Maker costs around $60, this is a pretty good deal. The software provides a limited range of instruments and loops as standard and you can buy more if you need them. If you want to add royalty-free music to your videos (even if you aren’t a musician!) this is a pretty good way of doing so. There is even a music-making program supplied as an added extra. This lets you make music tracks even if you can’t play an instrument! Overall, Movie Studio Platinum is a good video editing product for serious amateurs or even professionals on a tight budget. 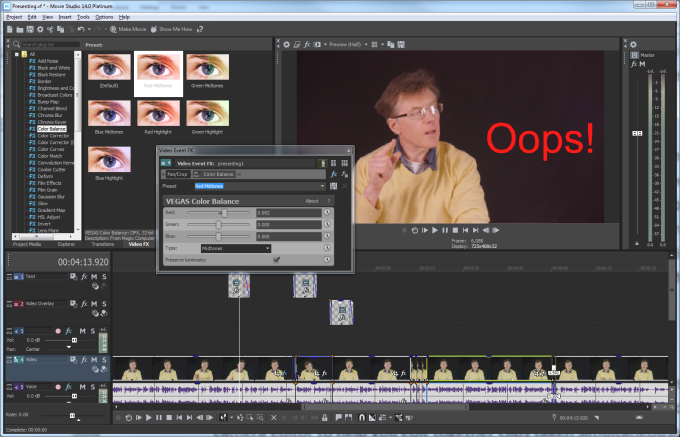 Its interface can be a bit over-fussy (all those popup dialog boxes – see my review of VEGAS Pro) so it is not, in my view, as easy to use as MAGIX’s other video editor, Video Pro X. Even so, at a price of around $80, it packs a lot of punch and is great value. If you decide that this is the program for you, I would recommend that you get the Platinum or Studio edition rather than the slightly cheaper entry-level edition. The entry-level version omits some important tools such image stabilization and colour correction, multi-camera editing and hover-scrubbing, it lacks the ‘DVD Architect’ for burning DVD and Blu-ray discs and its timeline is limited to 10 video tracks (rather than the Platinum’s 200). Given the fact that there is only a $30 difference between the price of the entry-level and Platinum editions, I’d say that opting for the Platinum would be $30 well spent! The VEGAS range – spoilt for choice? As you would expect, the range of editing features and addins (such as 3rd party effects) is more limited in the cheaper packages than in the more expensive editions. In fact, it’s bit more complicated than that. For example, the top of the Movie Studio range (Movie Studio Suite) seems to have some things that are missing from the bottom of the VEGAS range such as NewBlue Titler Pro Express plugin (which is not in VEGAS Pro 14 Edit). In addition, while the low-cost Movie Studio products include a copy of the Music Maker application, the higher cost VEGAS Pro products do not. At any rate, even by making a close comparison of the product features (see the Movie Studio http://www.vegascreativesoftware.com/us/vegas-movie-studio/product-comparison and VEGAS Pro feature comparison charts http://www.vegascreativesoftware.com/us/vegas-pro/product-comparison), it is by no means easy to determine which edition provides the best mix of features in its price range. To be honest, I think the mix of features spread across six alternative editions is confusing. In my opinion, six editions is a few editions too many.